Susan's Saga: The New Seasonal Catalogue is Here! Today is the day Stampin' Up! 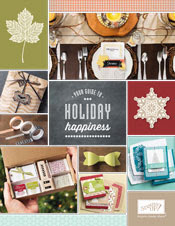 released its new seasonal catalogue! It is chock full of lovely stamps and supplies, including Christmas stamps, paper and embellishments. Just take a look at some of the wonderful banner kits and card kits! As usual, I want ALL of it. Lol! Stampin' Up! knows how to create beautiful yumminess to craft with. Take a look for yourself at what's new at SusanSalutations.